Proper cleaning and sanitation is critical. 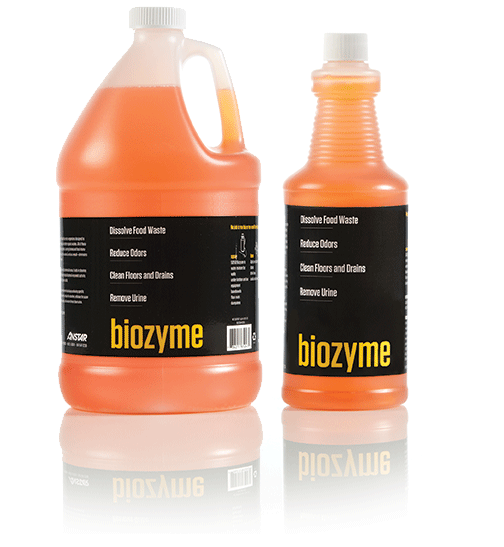 Biozyme is a unique blend of synergistic bacteria that removes scum, grease and grime. It’s unique triple-action formula allows it to be used in direct applications, foaming sprayers, and mop water. Ideal for food preparation areas, rest-rooms and other facilities that experience a regular build-up of food, grease and urine deposits on floors, baseboards, drains, under equipment bases, in ‘dead-zones’ and in cracks & crevices. The organic debris build-up causes foul odors, clogged drain lines, dirty mops and slippery floors. Biozyme works great in a B&G Sprayer. Use a 50/50 mixture to spray walls, under kitchen equipment, in ‘dead zones’, on baseboards, on rubber floor mats and in trash cans & dumpsters. Using our industrial foamer, apply un-diluted to floor & sink drains, drink lines, and exposed cracks & crevices. Add 4 to 6 ounces of Biozyme per gallon of mop water as your last cleaning step of each day. Allow to naturally dry (do not rinse) and as an added benefit, Biozyme will clean and deodorize your mop heads. A unique triple action enzymatic cleaner. 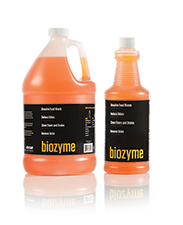 Biozyme is a ready-to-use concentrate available in both quarts and gallons. 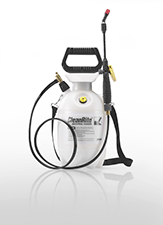 The 1 Gallon Biozyme Industrial Foaming Sprayer uses a dual feed supply hose that blends air and liquid to produce the consistency of product that you need for optimal application. The heavy-duty Biozyme Floor & Drain Brush Kit is the perfect combination of tools for floor drain sanitation in food preparation and storage areas. 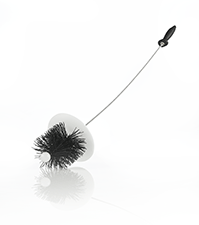 The long-lasting polypropylene bristles stand-up to rugged use and the 36″ handle is clearly marked in English and Spanish “use for floor drain only”. 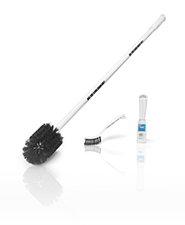 The Biozyme Flexi-brush is a unique tool that will clean floor drains with bends. The heavy-duty polypropylene bristles and splash guard stands-up to rugged use and is essential in the removal of organic debris in hard-to-reach areas.